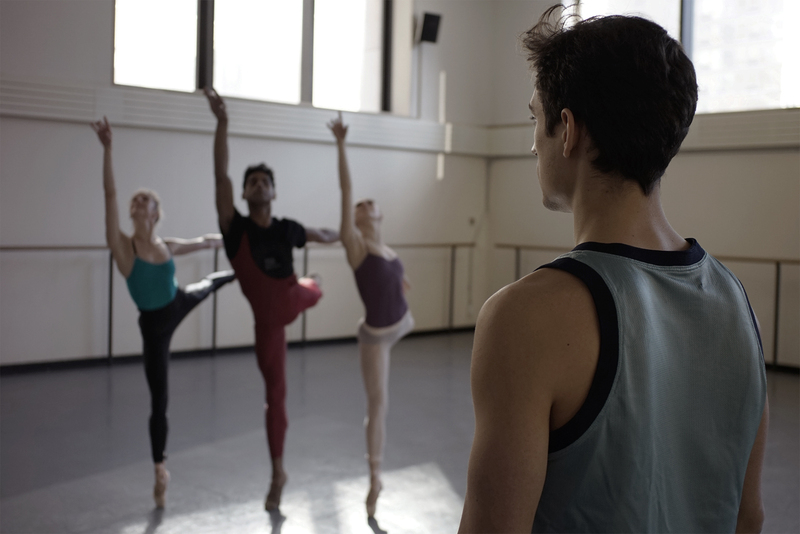 Justin Peck in BALLET 422, a Magnolia Pictures release. Photo courtesy of Magnolia Pictures. I have been much anticipating the arrival of the documentary film, Ballet 422, by Magnolia Pictures. The film brings together so much of what I love — the arts, ballet (New York City Ballet in particular), Lincoln Center — do I really need to go on? The film loosely chronicles the creative process for New York City Ballet’s 422 piece, choreographed by the 25 year old Corp de Ballet member, Justin Peck. I say “loosely” since the film takes an artistic route with focus on cinematography and voyeurism over a pure documentary approach. As we literally walk through the corridors of Justin Peck’s life, we get a glimpse into a world not usually accessible from the seats of David H. Koch theater. There are vignettes into Justin Peck’s creative process, rehearsals with Principal dancers, consultations with costume design and lighting, pep talks with the orchestra, dress rehearsals, and of course, the piece de resistance — when it all comes together for opening night. Ballet 422 captured my attention from beginning to end with its seeming simplicity and perfected beauty, which appropriately reflects the spirit of the New York City Ballet. Through the film, I developed a stronger appreciation for the work of the Balanchine grounded troupe and their innovation and modernization of the ballet art form. I came to understand the complexity of what looks in performances to be effortless — fabric selection, the dye process to get the colors “just right”, the thought behind each twirl and the related movement of the fabric, the attention to detail in each hand movement and jump — the effort that goes into it is incredibly impressive. The film also focuses on humility, with Peck going from proud choreography to Corps de Ballet member in the same evening. While we never truly get to know any of the dancers or even Peck, for that matter, we really aren’t meant to. Ballet 422 is a quiet peak into a world that evokes curiosity and admiration and I was happy to have a view. Ballet 422 is playing in New York City at Film Society of Lincoln Center (Feb. 6 – Feb. 19) and Landmark Sunshine (now – Feb. 19). This entry was posted in dance, film and tagged ballet 422, justin peck, magnolia pictures.